Docent Charlene Hughes leads a tour focusing on Hawaiian Quilts. If you are interested in attending this tour, please call the Education Department at 532-3621 to make a reservation. Through Hawaiian quilts, we can see a response to a century and a half of adaptation and change. On view will be 11 historic quilts from the museum’s collection in celebration of this Hawaiian textile tradition. Hawaiian quiltmaking is an art recognized the world over, and the majority of works feature a distinctive, dramatic floral design cut from a single piece of cloth appliquéd and quilted onto a background cloth, also of a solid color. The naming of Hawaiian quilt designs is the originator’s privilege; some are straightforward while others have poetic names that echo Hawaiian legends, as in Ka Ua Kani Lehua (The Rain That Rustles Lehua Blossoms), in reference to the delicate flower sacred to Pele, goddess of fire and the volcano. The show also reveals fascinating and important exceptions. 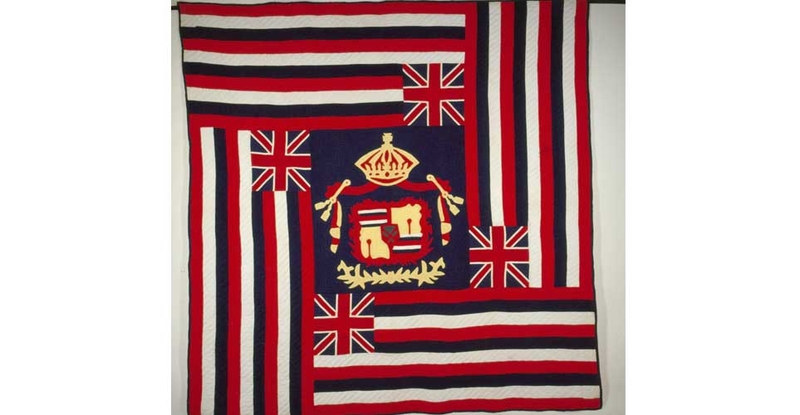 Prestigious flag quilts such as Ku’u Hae Aloha (My Beloved Flag), which pay nostalgic homage to the lost Hawaiian Kingdom, stand out in concept and execution. They boldly depict Hawaiian flags and the royal coat-of-arms. 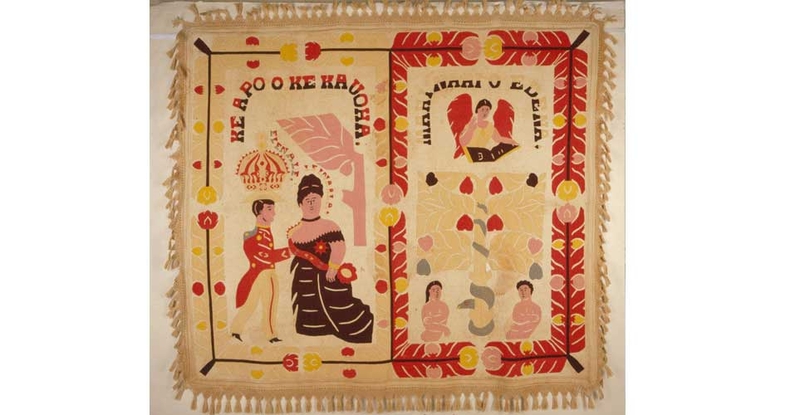 Quilt designs also reflect the makers’ aloha for and adoration of their beloved monarchs. Ke Kahi O Ka’iulani (The Comb of Ka’iulani) commemorates Princess Ka‘iulani (1875-1899), who lived in the twilight years of the Hawaiian Kingdom. The compelling Na Kihapai Nani Lua ‘Ole O Edena A Me Elenale (The Beautiful Unequaled Gardens of Eden and of Elenale) features unusual large-scale human images, and other quilts demonstrate imaginative patterns rarely seen in the tradition of Hawaiian quilt making. This exhibition is supported by the Hawaii Tourism Authority and the City and County of Honolulu. 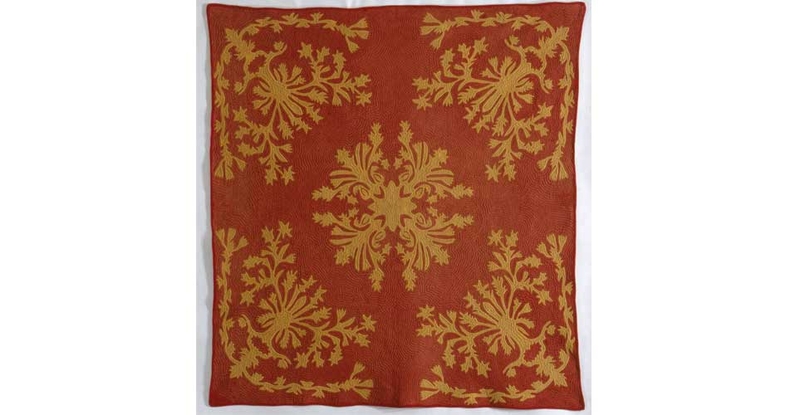 Hawaiian Quilts: Tradition and Transition catalog is available in the Honolulu Museum of Art Shop and online.